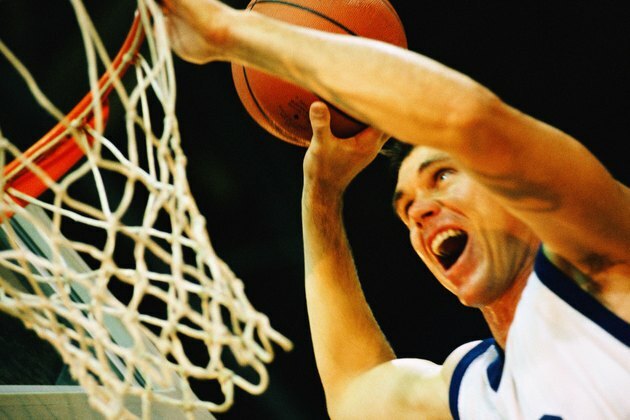 A basketball player who possesses strength and power and is conditioned will have performance advantages on the court. You will be able to jump higher, meaning you will have a better chance of coming down with rebounds and shooting over defenders, sprint faster to get up and down the court and be able to stay low in a defensive position. A full-body, comprehensive basketball workout will include strength training, plyometric exercises and court-specific conditioning. Schedule your full-body workout three days per week. For your workouts to be effective, give your muscles a day off in between each one. Improve your workout performance and reduce the risk of injury by performing a 10-minute dynamic warm-up prior to beginning each session. A dynamic warm-up includes light cardio such as jogging or jumping rope and then dynamic stretches such as leg swings, body-weight squats and skips. Begin your full-body workout with weight training, which will develop muscular strength and will help improve performance and reduce the risk of injury. A workout that will build strength in the major muscles needed for basketball includes squats, step-ups, deadlifts, bench presses, incline bench presses, shrugs, bent-over rows, preacher curls, calf raises, plate twists and front planks. Complete three sets of eight to 10 reps of each exercise, resting one to two minutes in between each set. After you've finished with strength training, move onto plyometric exercises, which are explosive activities that help a basketball player develop muscular power. Include cone hops, bounds and box jumps in your workout. Cone hops involve jumping forward-and-back and side-to-side over a cone as quickly as possible. Perform two sets of 10 reps of each. Front bounds are performed by lowering into a quarter squat and then jumping as far forward as possible. Once you land, go right into the next rep. Continue until you've done eight reps. Perform a total of two sets. Box jumps require the use of a plyo box. Facing the box, lower into a quarter squat and then explode into a jump and land atop the box. Complete two sets of eight reps.
Basketball players need anaerobic endurance in order to be able to continuously get up and down the court. Finish your workout with sets of liners and shuttle runs. For liners, start at the baseline and sprint to the free throw line and back, to the half-court line and back, to the opposite free-throw line and back and finally to the opposite baseline and back. To perform the shuttle run, place a single cone at half-court. Start at the cone and then sprint to the sideline on your right. Touch the line and change directions, sprinting to the opposite sideline. Touch that line and turn and sprint until you get back to the cone. Complete five sets of liners and shuttle runs, resting 30 seconds between each set.